This is a special time in Puerto Rican history, for 1998 marks the first century of Puerto Rican immigration to the mainland following the island’s separation from Spain and attachment to the United States. The journey to places like Newark, which has a large and growing Puerto Rican population, has not always been an easy one. Poor economic conditions on the island and unwelcoming arms on the mainland continue to cause hardship for new arrivals. The trickle of immigrants to the United States in 1898 increased to approximately 4,000 annually until World War II. Heavy unemployment on the island, low wages and an almost total lack of opportunity prompted the migration. In the 1950s, many low or semi-skilled jobs were available in Newark factories. As a result, the race for the promised land to the north of Puerto Rico continued unabated. This was aided by the easy passage by plane or ship, often for as little as $100. Other workers were recruited to work on South Jersey farms. In 1946, the Glassboro Service Association brought farm workers to that area of the state to a former Works Progress Administration camp. In 1947, the Puerto Rican Department of Labor sponsored a migration plan in association with federal, state and local service agencies. Eight New Jersey employment service offices were opened to provide the state agricultural and industrial workers. As a result, many islanders moved north seeking better living conditions. Although most of the workers had few employment skills, they were willing to accept any type of job as long as it was honest work. Soon, a lasting pattern of exploitation and discrimination developed. Most of these people were willing to work cheaply, often in factories whose bosses did everything possible to exploit the situation. In the 1960s, Maria Gonzalez, a Puerto-Rican born member of the Newark Human Rights Commission, noted, 'In Puerto Rico, we enjoy all the rights of citizens, yet here we discover that we are considered immigrants, a minority group, a separate entity. Yet we are Americans!' Nevertheless, by 1966 she saw Puerto Ricans making 'slow but steady progress toward acceptance into the community.' Articles in the old Newark News and The Star-Ledger indicated a worsening plight of Newark’s Puerto Rican resident as the 1970s approached. Substandard housing continued, city agencies lacked sufficient census data on Spanish-speaking families, family income was the lowest of any group in town and the student dropout rate was the highest in the school system. In 1974 the lid blew off with riots at a Puerto Rican Labor Day festival in Branch Brook Park. After mounted police broke up a dice game, two cruisers were burned, a horse was injured, and rumors circulated that a young girl had been trampled to death. In a second bloody day of rioting, two people were fatally injured and sniper fire was aimed at police from rooftops. Some stores were looted. Mayor Kenneth Gibson led a march down Broad Street and out of the park and negotiations continued at City Hall until the situation was brought under control. As trouble began winding down on Thursday, Gibson called for the Essex County prosecutor to investigate. Puerto Rican leaders claimed 'their people have been victimized by the city (and) that the city administration has failed to meet the needs of the 70,000 Hispanics that live there.' Obviously, these troubles were a long time coming. And, again, the same old problems were blamed—as education, employment, housing, health and welfare, plus the fact that in the previous year only 137 Hispanics had graduated from high school. As a partial remedy a massive voter registration drive in the North and East wards was begun in 1975 by the Hispanic Emergency Council. The registration goal was 30,000 names. Schools, churches and civic organizations were called upon to participate in the first attempt by the Spanish-speaking community to become a united force. Agencies that took part in the campaign included La Casa de Don Pedro, the Puerto Rican Veterans Association, ASPIRA, FOCUS and the Puerto Rican Merchant Association. The following year the Latin American Cultural Council began offering summer jobs to high school students. The council also created three branch social service centers. In 1976, the Newark Human Rights Commission issued recommendations after an investigation into the causes of the Labor Day riots. The report found a serious lack of accurate census information about Hispanics and cited discrimination in government and in the private sector. The commission recommended an affirmative action plan. It required the addition of more Hispanic police and fire personnel, publication of city documents in English and Spanish, the appointment of more Hispanics to city boards, increased residency in housing authority projects, increased voter registration efforts, Spanish awareness programs for non-Hispanics, tax abatement on construction sites for Hispanics, and increased cooperation with bilingual agencies. The report also indicated the need to reduce the high school dropout rate among Hispanics, improve reading levels and increase funding for Hispanic projects. In 1970, Dr. Hilda Hidalgo’s publication, 'The Puerto Ricans in Newark, N.J.,' produced one of the most complete examinations ever made of the community. Hidalgo estimated the Puerto Rican population to be 45,000. Although she viewed the mayor’s appointment of Ramon Aneses as deputy mayor as a positive step, her view of the Puerto Rican community was brutal and unflinching. Hidalgo found that most Puerto Rican immigrants were in the unskilled or marginally skilled poor class. 'They have been pushed to the U.S.A. by extreme poverty and lack of opportunity in Puerto Rico. They are unfamiliar with the ‘system,’ fearful of the establishment and are non-competitive. They represent generations that have been marooned in economic poverty.' At that time, she said, the majority of Puerto Ricans living in Newark had been here for over five years, although 'many return to the island and regard their stay as transitory. Children often speak for families that cannot speak English, with the role of the parent and child reversed. They tend to be apprehensive of medical facilities and preventive medicine and use them only as a last choice. 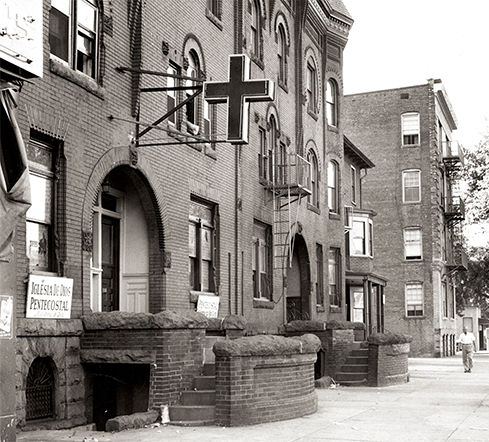 Planned parenthood is used by relatively few families, and they generally live in the city’s worst housing. Eating habits tend toward native fruits and vegetables that cost more to import, and bodega prices tend to range to 5 to 10 percent higher than regular grocery stores.' Hidalgo cited the great need for organizations like FOCUS and ASPIRA, which were 'very sensitive to Puerto Ricans' and included Puerto Ricans in key positions on their boards. In the late 1980s, the late Fred Byrd of The Star-Ledger reported on the 'invisibility' of Newark’s Puerto Rican population, noting that '…blacks are very much in the consciousness of our society, but unfortunately this did not extend to the city’s Puerto Ricans.' Byrd found that Newark’s Puerto Rican population was the city’s fastest growing community, and that both its white and black communities were declining in number. According to Byrd’s report, Puerto Ricans arrived in Newark in three successive waves. The first was in the 1950s when the city’s brewery, leather, iron and transportation industries still offered plenty of semi-skilled jobs. By the 1960s many of the older factories were closing, resulting in a loss of many low-paying jobs during the second immigration wave. The third wave came in the 1970s when New York Puerto Ricans began moving here in search of better housing, safety and employment opportunities. Because of limited job skills, the immigrants were paid less than others. As large factories began relocate, merged, and moved south, more people were suddenly competing for fewer positions. The result was even higher unemployment. As Hidalgo found in her study and Byrd also noted, language difference, low technical and basic training, minimum employment experience and a changing labor market worked to the disadvantage of many Puerto Ricans. To assist in the improvement of life of the Hispanic community in general and the Puerto Rican specifically, a variety of social agencies have come into existence over the past 30 years. Three key agencies are FOCUS, La Casa de Don Pedro and ASPIRA. More than a half-dozen other agencies serve specific interests of the community. FOCUS, an acronym for Field Orientation Center for Underprivileged Spanish, was organized in 1968 by Jose Rosario for 'all Hispanics in Newark.' It became the first community-based, multi-service agency for New Jersey Spanish. Rosario wanted to create a self-help organization because 'I saw the discrimination in Newark, so I had to help my people.' During his 25 years of leadership, he helped get Spanish-speaking interpreters into the county courts and led the fight to have high school equivalency examinations be given in Spanish. The agency’s FOCUS Victoria Broad Street serves more than 8,000 clients annually. La Casa de Don Pedro Inc. on Park Avenue was founded in the 1940s and opened its Newark chapter in 1971 in the North Ward. Named for Don Pedro Albizu Campos, the father of Puerto Rican independence, it is one of the state’s largest Hispanic social service organizations. La Casa offers a wide range of services to residents of the lower Broadway section. Founded in 1969, ASPIRA means to inspire or 'to motivate Hispanic youth to aspire to be the best they can be.' The nonprofit organization dedicated to promoting education and leadership development services for Hispanic youth runs four additional centers in Passaic, Hudson, Mercer and Camden counties. A network of ASPIRA clubs serves youth in elementary, middle and high schools as well as colleges. Services for students include personal counseling, academic and career help, financial aid, tutoring and field trips.